The conservation group has created posters that can hang in a ship's bridge. A new pictorial guide should help mariners in the eastern Arctic to identify and avoid disturbing marine mammals like whales, walrus, seals and polar bears. The Eastern Arctic Mariner’s Guide, unveiled at a Canadian Marine Advisory Council meeting on Monday by the World Wildlife Fund-Canada, is made up of three large posters to be hung on a ship’s bridge. These feature, among other information, a chart with images to help mariners recognize whales, seals, polar bears and walruses. 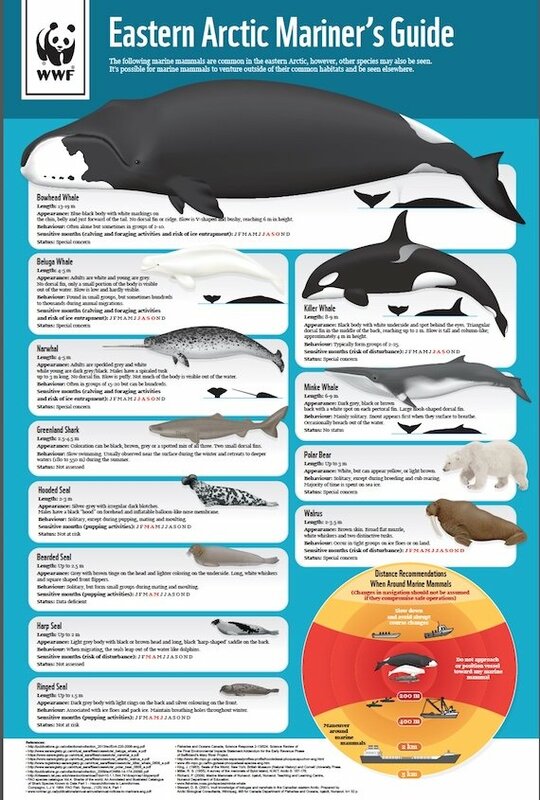 One of the posters of various marine mammals included in the Eastern Arctic Mariner’s Guide, released May 16 by WWF-Canada. WWF-Canada said it plans to put the guide, which follows the release of its Mariner’s Guide to Hudson Strait, directly into the hands of shipping company owners, operators and federal regulators. “Without this kind of information built into voyage planning, mariners have no way of knowing when they are crossing through sensitive wildlife areas or community travel routes,” said Paul Crowley, vice president of Arctic conservation for WWF-Canada, in a release on the new guide. The guide’s maps show where animals live, their migration routes and calving areas, conservation and ice areas, as well as where people travel and where caribou may cross the ice. The guide suggests courses of action when, for example, icebreaking or shipping in polynyas and around floe edges. There’s also a list of phone numbers so mariners can report sightings and incidents to the proper authorities. “Shipping around my community of Pond Inlet has drastically increased over the past few years, mainly due to tourism and ships servicing the Baffinland mine. Activities like these have the potential to interfere with community uses, disturbing and disrupting our ability to feed our families,” he said in the release. That’s because ship traffic can often drive marine mammals away from their usual habitat, the WWF said, while icebreaking can damage caribou migration routes.